This book lays to rest one myth: that horror films get no respect. It's a widespread myth, promulgated probably without much thought, repeated because everyone else repeats it. I've heard it at horror conventions. I've heard it from horror artists. I've come across a number of horror film festivals that lament that horror is an ignored, shunned, and disrespected genre -- and so such-and-such festival was founded to finally give horror its due. Forgotten, by who? Not by the major studios, which recognize that horror is big box office. Ignored, how? The entertainment news media and academic presses both generously cover horror. Sure, Oscar usually overlooks horror, at least for its major award categories. But horror is not starved for awards. Horror has dozens of prizes and plaques and trophies seeking to honor the genre. Several of them claim to be "the Oscar of horror," but it would perhaps be more accurate to say that horror has many Oscars. I doubt that any genre has as many film festivals devoted to its celebration and promotion. Far fewer festivals are devoted to science fiction or fantasy -- and most of those welcome (and are sometimes dominated by) horror. Indie film festivals outnumber horror festivals. (Probably, I'm actually not certain.) But again, horror is welcome even at the more prestigious indie festivals. So let's forever end the myth that horror is forgotten, ignored, or unappreciated. Horror has many suitors. She is a darkly alluring lady who's dropped her handkerchief, whereupon a throng of admirers crowd about her to offer assistance. Horror doesn't need any more dance requests, or bouquets, or expensive gifts. She needs help in keeping track of the many she's already received. It has three parts. First, a text portion examines horror film festivals from around the world, offering tips and insights to filmmakers and festival directors alike. Second, there is a directory of horror film festivals and awards, past, present, and prospective. And finally, a roster of horror's many festival and award winners. It's an extensive list, forming the largest part of this book, and offering overwhelming evidence of all the honors available to horror films (and TV shows) and to those who create them. Unlike Oscar or Emmy, it's especially important to record horror's many award winners, because, though horror film festivals are numerous, they are also ephemeral. If their winners are not recorded in some permanent form, and soon, they'll begin disappearing down a memory hole. Some of them are already lost to history. To understand why this is so, you must realize that this book would not have been possible a decade ago, due to lack of material. A few of today's genre film festivals date back to the 1960s, but the real flowering of horror film festivals occurred during the 2000s. Most of the festivals in this book's directory were founded after 1999. Ten years is old for a horror film festival. Screamfest L.A. and Shriekfest -- Los Angeles's two most renowned horror film festivals (there are at least seven others in the L.A. area) -- were both founded in 2001. Ten years of continuous screenings. Many festivals survive only a few years. Yet for every festival that dies, it seems three new ones arise. A disproportionately large number of horror festivals were founded in just the last two years -- 2009 and 2010. I suspect several factors contributed to the past decade's horror film festival boom: 1. the rise and success of indie film festivals in the 1990s; 2. the spread of inexpensive production equipment, creating a flood of horror films seeking promotion and distribution; 3. the growth of the internet and social networking, making it easier to promote both films and film festivals. The internet has both blessed and cursed horror filmmakers. Cyberspace fueled the horror film festival boom, but it was also the sole repository for many of their winners lists, either on festival websites, or as reported by online genre magazines. Cyberspace offers speed and breadth, but not permanence. Festivals and online magazines die. Their urls and web hosting agreements expire; the webpages listing the festival winners vanish. Adding to the researcher's frustration, some festivals only list their more recent winners online. They update, but don't archive. In some such cases, festival directors helpfully emailed me their lists of past winners. In other cases, I hunted for orphaned webpages listing previous winners, Googling or guessing at the likely urls. Directors of defunct festivals, when I found them, sometimes seemed indifferent about locating their old records, and had to be politely prodded every few months. A director of a festival that was still running had no records of his earlier winners, and could not remember them. A few former festival directors may have lost interest in their festival's history, but the winning filmmakers (and cast and crew) care deeply. So too the fans, I think. It takes much effort and expense to complete a film, enter a festival, and actually win. The winners deserve to be memorialized in a permanent record. This book is that record. Why are horror film festivals so ephemeral, their winners so easily forgotten? Partially because horror festivals, like horror films, are a largely indie, grassroots phenomenon. Yes, some festivals have grown up and turned corporate. They are old, well-established, profitable, and professional. They keep good records. But other festivals are young, impoverished, labors of love, run by a group of friends or even one person. If that person feels overwhelmed and quits, the festival dies. It can't happen to Sundance or Cannes, with their big budgets and boards of trustees and directors, but grassroots horror festivals live more tenuously. I founded the Tabloid Witch Awards in 2004. I run it alone. It turns no profit. People ask why I do it. For the same reason that others take up indie filmmaking, indie music, self-publishing, and blogging. Inexpensive technology and the internet are empowering grassroots artists, journalists, promoters, and critics. Some people make films. Others start a film festival. This book's text portion incorporates interviews with some two dozen horror film festival directors. This "behind the scenes" look should help horror filmmakers make better films, and take fuller advantage of their festival experiences. It should also assist film festival directors, both current and aspiring. I expect many new horror film festivals will be started over the coming years. If you know of any festivals or award winners that should be included in this book, or know of any changes, updates, or corrections, please contact the author at thomas at sipos dot org. A final note. 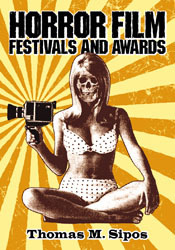 I often say festivals and awards because not all horror film awards are presented by film festivals. The Academy of Science Fiction, Fantasy & Horror Films presents the Saturn Award; Spike TV presents the Scream Award; Fangoria magazine presents the Fangoria Chainsaw Award. There are others, and their winners too are listed in this book. A new book out this year from McFarland, Horror Film Festivals and Awards by Thomas M. Sipos, is a work of wondrous obsession. Not only does it go into detail about what it takes to mount an Independent Film festival -- from raising money, to attarcting filmmakers and publicity -- but it also devotes about 150 pages to listings of hundreds of film festivals in the United States and around the world, and listings of film awards ranging from the Saturn and Hugo Awards to just about every Film Festival award under the sun. And yes, every winner of the Rondos -- eight years of them -- are fully listed as well. While the listings are fun to flip through, we suspect the advice and experience offered by Sipos in the opening chapters will be invaluable to fillmakers and organizers as well. It's a bit pricey -- $40 -- but a fun work of love.